Installing a total home security system has never been this easy or affordable. You can install a complete system with burglary, fire, carbon monoxide, freeze and water sensors in about two hours, without fishing a single wire. You can even add wireless video surveillance and get central-station monitoring for about half of what professional alarm companies charge. Starter kits run about Ksh. 30000, but plan to spend around Ksh. 50000 to Ksh. 80000 to protect an average-size home. 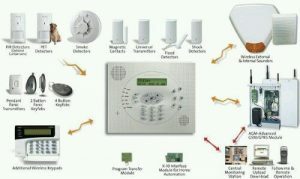 Designing the right home security system requires some planning, so don’t rush out and buy a kit as your first step. You’ll wind up short on components you need and have extras that you might not use. Some burglaries and assaults happen at night. But the vast majority happen during the day when no one is home. Some burglars break glass to reach in and unlock doors and windows. But the smarter ones don’t because they don’t want to leave blood DNA at the scene. They’d rather kick in your door or pry open a window. So your first step, before you even think about buying an alarm, is to reinforce all door jambs and add better locks to all vulnerable doors and windows. Keeping doors and windows locked is your first line of defense. Make wireless alarms your second. The alarms are activated by doors or windows opening. Burglars hate noises, so even a small alarm usually sends them running. The alarms are available at home centers or search online. Use the alarms for doors and windows in “hidden” areas of the house where you don’t normally gather and that are often dark. The primary goal of any security system is to detect burglars before they enter your home. That requires a sensor on every vulnerable exterior door and window. That way, the system can activate the instant a burglar cracks a door or window. With the siren screaming, most burglars choose to run, rather than risk getting caught. You’ll have to fix the broken window sash or door jamb, but you’ll still have your belongings. Every openable window and door on the main floor is vulnerable. However, if you have an elevated deck with stairs, you must also protect the second floor patio door and all windows accessible from the deck. Here’s the back side of a typical home. There are eight very accessible and easily openable doors and windows. Each door and window must have its own sensor. Skimping on door and window sensors is the biggest mistake anyone can make. Trust us, the one window you skip, is the one window they’ll choose to enter.